Ishida Shouya was in the sixth grade and that is when a new transferred student who was known by the name, Nishimiya Shouko, was bullied by Shouya to the point where she was compelled to transfer to a different school. Consequently, he was ostracized by all the students of the school. He later felt the guilt, got bullied by his friends and he lacked confidence in himself completely. Being a fan of anime, I would say, this is one of the best anime movies I have ever seen. The movie begins with the main character named Shouya, who was in a high school and decided to commit suicide. He had depression, social anxiety and guilt within himself and he had attempted to commit suicide many times without luck. This section was well explained in the second part of the story. While Shouya and Shouko were in sixth grade of the same school. Shouko was a transfered student and a deaf. She got bullied especially by Shouya and his friends. 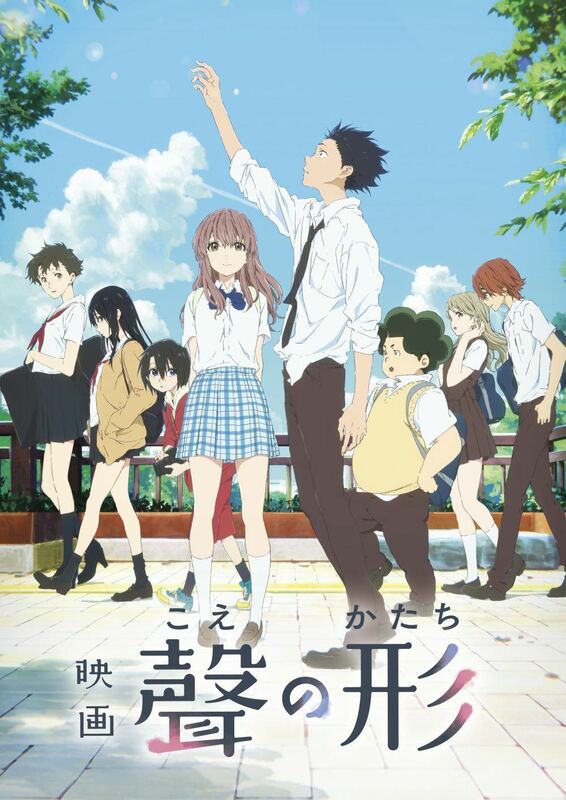 This anime portrays the bullying in elementary schools from the perspective of a bully rather than the victim. When she was introducing herself to the other students, they were all surprised hearing that she was a deaf. However, only Shouya over-reacted for her deafness and he, from that time onward, started to hate her as she was a deaf. The teachers asked all the students to befriend her and to treat her well. But she constantly got bullied by Shouya and his friends. She was bullied to a point that she was compelled to transfer to a different school. But for such activities of Shouya, Shouya's mom had to pay back 7 million yen as damage to Shouko's mom. Shouya was shocked seeing the bleeding ear of her mom. It was the trigger of the changing of Shouya as a person which was portrayed well in the second part of the story. The first part of the story make you hate Shouya but you will have different opinion of him in the second part of the story. Five years later, when Shouya was in high school, he was bullied by others and he was almost alone because when he was in elementary school friends spread the word about such activities. Consequently, Shouya got detached from all the students and he was suffering from social anxiety to the point where he was unable to look at the eyes of other people. This is the best part of the movie where the people who he did not know were marked Cross "X". The director of the movie has done a great job at that and I personally have never seen it in other anime movies till today. Shouya was learning sign language in a sign language learning class and he always wanted to apologize to Shouko for what he had done in the past. While he was attending a sign language class he met her and asked her to be his friend. Shouko was surprised to see him and she realized that he had changed a lot. However, he tried several times to apologize to her but in vain. It is quite obvious that a person can change with time and this movie is the prime example of the one which demonstrates the change in one's personality with time. However, these changes are the result of such experiences. However, the story ironically brings both the characters together. But Shouko's mom did not accept the fact that Shouko and her little sister was talking to that guy as she used to hate him from the core of her heart. But her opinion about him soon changed when Shouya saved Shouko's life by putting himself in danger for her. This incident had created a great impact on her family members especially on her mom and her little sister. They also begged for apology from Shouya's mom for this incident when Shouya was in the hospital, still fighting to survive. However, the God had given him last chance to make everything right and finally, both of Shouko and Shouya met again. While he was in the hospital, Shouko took a stand to reinstate everything which she had destroyed and she was undoubtedly successful at her mission in the end. Finally, Shouya reincarnated into a new person who was no more afraid of looking in people's eyes, openhearted and the crosses fell off everyone's face around him and he no longer felt any kind of social anxiety or guilt thanks to Shouko who was always by his side. My opinion: This anime movie is undoubtedly one of the best movies I have ever seen which is as good as Kimi no na wa (Your Name) but with more realistic plot. The art style, animations, story are nicely done. It could not have been executed any better than that and I am quite satisfied with the ending. However, this anime does not focus much on the romance between the two characters, Shouko and Shouya but on the moral of the story. It portrays a realistic picture which I have never seen in an anime. All in all, it is a great movie and has a nice back story which is understandable. Have you watched this movie? Did you liked it or did not you like it? Share your opinions below.